Christoph Wittmann, James C. Liao, "Industrial Biotechnology: Products and Processes"
The latest volume in the Advanced Biotechnology series provides an overview of the main product classes and platform chemicals produced by biotechnological processes today, with applications in the food, healthcare and fine chemical industries. 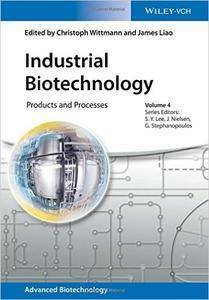 Alongside the production of drugs and flavors as well as amino acids, bio-based monomers and polymers and biofuels, basic insights are also given as to the biotechnological processes yielding such products and how large-scale production may be enabled and improved. Of interest to biotechnologists, bio and chemical engineers, as well as those working in the biotechnological, chemical, and food industries.